It was between 1939 and 1942 – during his time in America – that Benjamin Britten first turned his attention to the folksong. Having left England at the outbreak of war along with other notorious Pacifists W.H. Auden and Peter Pears, Britten publicly espoused the view that England was 'finished'. In private however the composer began work on a volume of English folksongs arranged for tenor voice and piano – the first of six produced throughout his career. While the earlier work of Vaughan Williams, Cecil Sharpe and George Butterworth treats its folk sources with a reverence that freezes them into a perpetually and inherently nostalgic musical landscape, Britten's reworkings – for his manipulation surely goes beyond the scope of 'arangements' – are far freer, deploying the traditional melodies within a self-aware and distinctly contemporary sensibility. In Britten's hands the lyricism and 'quiet…charm' of English melodies remains, but is paired with a daring technique and bolder harmonic style that brings out the subversive violence and grief of many of the songs, as well at times as their playful modernity. Although this new recording is evidently the work of a young singer with much to hone in technical terms, it should be said at the outset that Steve Davislim's disc is a joy, charming despite its evident faults. Supported by the intelligent accompaniment of Simone Young this young Australian tenor rollicks and croons his way through a broad selection of Britten's earliest folksong adaptations including oft-performed classics 'The Salley Gardens' and 'O Waly Waly' as well as lesser known works 'Tom Bowling', 'Avenging and Bright', 'Oft In the Stilly Night'. With a pleasingly rounded tone that is as full as is possible without straying into heroic territory, Davislim provides a more robust approach to the repertoire than the feather-light English school of Phillip Langridge, Ian Bostridge, or even Peter Pears himself; this in turn gives Young greater scope to relish Britten's meticulously constructed piano parts without fear of challenging the melodic line, a fact she takes full advantage of throughout, leaving the listener in little doubt of the piano-voice interplay upon which the success of these songs so depends. The disc's high points are mostly among the brisker more full-blooded numbers; these allow Davislim to release the fuller tone which seems to come most naturally, and which in more delicate songs occasionally feels strained with the conscious effort of creating fragility. Both 'Tom Bowling' and 'Sally In Our Alley' have pianissimo climaxes that fall exceedingly high in the range, and the result is not entirely controlled. The joyously affirmative 'Come You Not From Newcastle' however, with its gradually decaying accompaniment, allows Davislim to make a virtue of his youthful energy, and the warmth of his vocal tone here adds conviction in the high tessitura of the refrain where lighter voices tend to struggle. Equally convincing is Davislim's 'The Minstrel Boy' whose militaristic pomp and heroic sentiment are rendered as straight-faced as the poet himself. The throw-away masterpiece 'Oliver Cromwell' must be perfectly judged if it is to come off, and Davislim and Young do come close. Sadly however Davislim's fidelity and literal approach to the vocal line denies it the character that a little irreverence might easily have achieved, and the resulting effect is a little heavy both in the voice and piano. Where Davislim falls down is in the more lyrical songs. More than any other national tradition the melodies of the English folksong demand a legato line, and expose cruelly and quickly any failure to achieve this. The disc's opener 'The Sally Gardens', with its long arpeggio-based phrases, is a case in point. Too often intrusive h's creep into the melismas as Davislim's support works over-hard to sustain the line. The small reiterations of breath on each quaver would work beautifully to bring clarity to a Handel or Mozart aria, but here bring unnecessary lumps to a line that should be as seamless as possible. Both 'O Waly Waly' and 'Early One Morning' suffer from similar issue of line. It seems a counter-intuitive criticism but often it is Davislim's obvious musicality that is his undoing; too often his eagerness to convey the direction and nuance of individual phrases means that he sacrifices the over-arching line of the verse or song as a whole, creating a slightly sea-sick feeling in the listener and losing the simple purity of the song's structure. 'The Ash Grove' suffers a little from this, as does 'Dear Harp of My Country' where Davislim's over-lightening of the scotch-snap rhythms takes the entire song off the voice, effectively preventing him from singing through the phrases. While Davislim's issues of technique are undeniable this disc has an energy about it which, if not precisely polished, has a persuasive charm that suits these songs well. While Britten's sophisticated songs take their melodies musical miles from their rustic contexts, they are nevertheless the bravura works of a young composer with much to prove, and themselves occasionally stray into brashness or self-congratulatory demonstrations of skill. 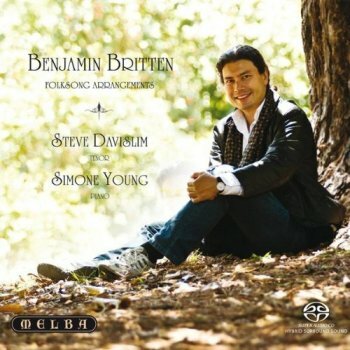 Davislim's bold approach and full tones match the extrovert spirit of the youthful Britten, and the result is a disc that gives a lively and faithful account of these beloved works.